A boy in air with balloons – This wallpaper is not that great until it is showcased on the hottest phone of 2013 i.e. Samsung Galaxy S4. All of sudden, this image now appeal to majority of users as it somehow relates to the best phone in market. Well, I don’t even remember the default wallpaper showcased on HTC One, but this one on S4 has captured our minds. Well, feelings aside, if you’re looking for lively eye-appealing experience on your android phone be it of Samsung, HTC, Sony or any other brand, here is something for you! [sch i=”description” c=”You can now have Galaxy S4 live wallpaper with cool water ripple effects and light animation particles on your android phone for free. This live wallpaper app is developed by Kiwi and is available for free from Google Play Store”]. I’ve personally tested this and installed this on my Samsung Galaxy S2 phone. 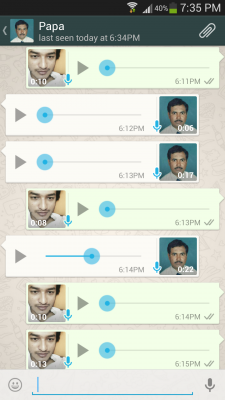 It works without any problem or lag. It is smooth. It feels nice. Whenever I tap on my screen to open any app or just to browse HomeScreen, the cool water ripple effect pleases me. The water ripple effect generates automatically. There is inbuilt option to enable/disable the same. 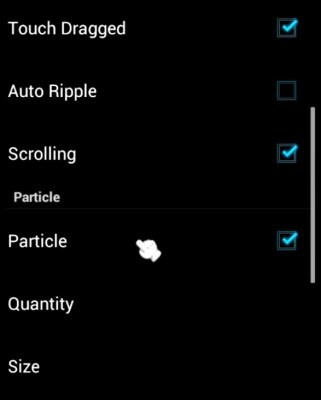 You can even switch to light mode via its setting in which ripple mode will not be visible, instead little light animation particles will start flowing on the screen. It has setting for adjusting fps, speed, size, quantity of particles as well. The resolution, clarity, crispness – everything is superb. It comes with application interface i.e. after installation, you’ll find an application listed in your apps menu with the name – Galaxy S4 live wallpaper. Just launch the app to apply the live wallpaper or adjust various settings available for the same. It is compatible with most phones. You can optimize it on your phone by adjusting fps based on your phone performance and specification to get better results. The only annoying thing with this live wallpaper is that it comes with ads/advertisement, but the ads are only visible on settings page, so don’t worry about getting ads on HomeScreen or anything like that. The ads will disturb you only when you adjust live wallpaper settings. Download [sch i=”itemReviewed” c=”Galaxy S4 live Wallpaper”] for free from here. You can install this on HTC One, Sony Xperia Z, LG Optimus G, Galaxy S2, S3, Note, Note 2, or other android phones as well, like Micromax, Lava, Karbonn, etc. Galaxy S4 Live Wallpaper by KIWI is a very good live wallpaper for android phones. When you install it for the first time, you feel like you’ve a completely new phone. Exciting! is it Galaxy S4 live Wallpaper & Ripple Effect avaliable for lenovo smart phones?